The fall season is almost here! 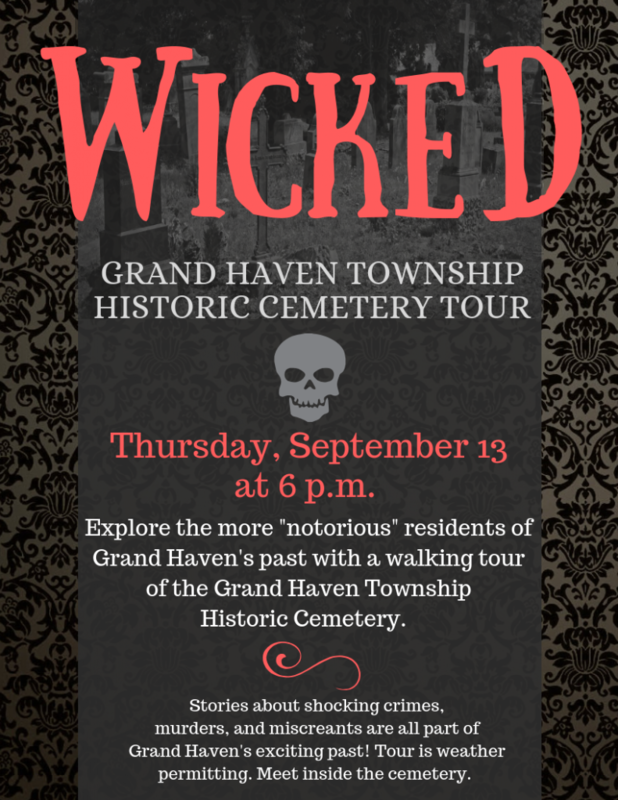 We just finished our first “Wicked” Robinson Township Cemetery tour and it was a smash hit! We had around 153 people show up! Way to go Robinson Township! The Grand Haven Township Cemetery tour is on Thursday, September 13 at 6 p.m. and our last tour of the season ends with Lake Forest Cemetery in downtown Grand Haven at 6 p.m. on Thursday, October 4. Tours are weather permitting and you must be able to walk. Lake Forest Cemetery is LARGE and the tour takes about 1.5 hours + depending on the size of the group. If you have never taken a “Wicked” cemetery tour, we explore old true crime, murders, miscreants and other misdeeds about the people buried below. It’s super fun and a great way to start learning about local history.